So What’s The YardMax Mode All About? Maximizing your dog’s containment area and giving your furry friend up to 30% more room to play, the YardMax dog fence is ideal for smaller yards. On top of that you get PetSafe limited lifetime warranty that guarantees any replacement part you need within the first year will be free. After the first year you get a huge discount on any part you need replaced for the lifetime of your fence. Along with that you get free shipping and a 90 day warranty on the part. Although the PIG00 11115 offers two different modes, without a doubt the highlight of this system is its namesake — the YardMax mode. Exclusive to this in-ground dog fence, users love that this mode makes the most out of their dog’s play space. Traditional vs YardMax mode — what’s the difference? You’ll use the dog fence wire to create a perimeter around the area you want to contain your dog in. The wire can also be used to keep your furry friend out of off limits areas such as a flowerbed, garden or pool. Your transmitter sends a weak radio signal along the wire and as long as your dog stays within the Safe Zone they’re free to run around and play without receiving any kind of correction. But if they get too close to the boundary wire and enter the Correction Zone their receiver collar beeps, warning them to turn around. 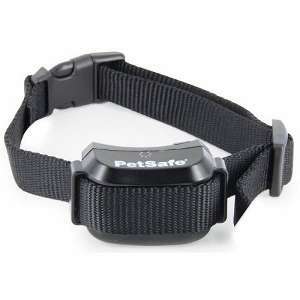 If they fail to retreat their collar delivers a static correction which is designed to get their attention and remind them to return to the Safe Zone of the yard. The twisted wire represents ‘dead zones’ and those are areas your dog can pass over freely without receiving any kind of correction. What’s important to note is that in the Traditional mode your Correction Zone radiates an equal distance on both sides of the wire. When your fence is in the YardMax mode your dog’s Correction Zone doesn’t start until they actually cross the boundary wire. At that point they get a warning beep followed by a static correction if they ignore the beep. It extends your Safe Zone all the way to the boundary wire. That means up to 30% more play room for your four legged friend. Because it maximizes your containment area it’s ideal for smaller yards. The Correction Zone doesn’t start until your dog gets right up to the wire so the YardMax mode gives your pet the perception of an infinite Correction Zone. This decreases the risk of them running through the fence line and leaving the yard. Unless you have more than 10 acres to cover there’s simply no reason why the YardMax in-ground fence shouldn’t be at the top of your list. With 2 different modes — each offering a different type of setup — this system can cover your yard no matter what type of containment area you want. The YardMax mode makes it ideal for people with smaller yards and those who want the added protection of its extremely effective Run Through Prevention feature. The Traditional mode allows you to completely customize your layout. The progressive levels of correction will make your dog think twice before running through the fence and in either mode the YardMax is loaded with safety essentials and unique features that you just can’t get with any other DIY dog fence. Although it’s only been around for about a year and a half, the overwhelming majority of users love the 11115 in-ground fence. 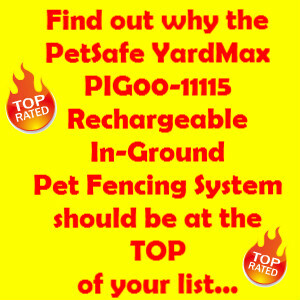 There’s a lot to like about this fence so I didn’t find a lot of complaints in the PetSafe YardMax reviews. But overall the vast majority of people using this fence say it gives excellent value for your money. Not only is it packed with all the essentials, it also has features that no other fence has. Add to that the flexibility of using it as a traditional fence or in the one-of-a-kind YardMax mode and you simply won’t find another fence for around $300 that can hold a candle to the PIG00 11115. Without a doubt installing an in-ground fence isn’t easy; it takes a bit of planning, some time and depending on your layout, it can take a fair amount of elbow grease. But all underground dog fences are like that and in comparison to similar DIY dog fence models the YardMax is no more or less difficult. If you’re setting the PIG00 11115 in YardMax Mode then it’s fairly straight forward because your only option is a single loop around the perimeter of your dog’s containment area. If you’re going to use it in Traditional Mode it might end up being more work if you want to set up the exclusion zones so that you can keep your canine buddy out of areas like a flowerbed or garden. I won’t go into detail about how to install the YardMax but I do want to talk a bit about one of the major components — the transmitter. The PetSafe YardMax transmitter is the heart of your system and you’ll use it to choose the mode you want and also to set set the boundaries of your dog’s containment area. 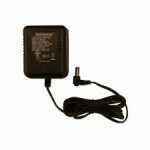 About the size of a smoke detector your transmitter mounts on the wall and needs to be plugged into a standard outlet. Indicator lights tell you at a glance, that your system is functioning properly and that it’s OK to let your dog out so they’re a handy feature to have on an electric dog fence. Boundary Width Dial: Adjusts the distance from the fence line that your dog’s receiver collar will activate. In the Traditional mode it radiates equally on both sides of the boundary wire and your dog’s receiver collar is activated as they approach the Correction Zone. 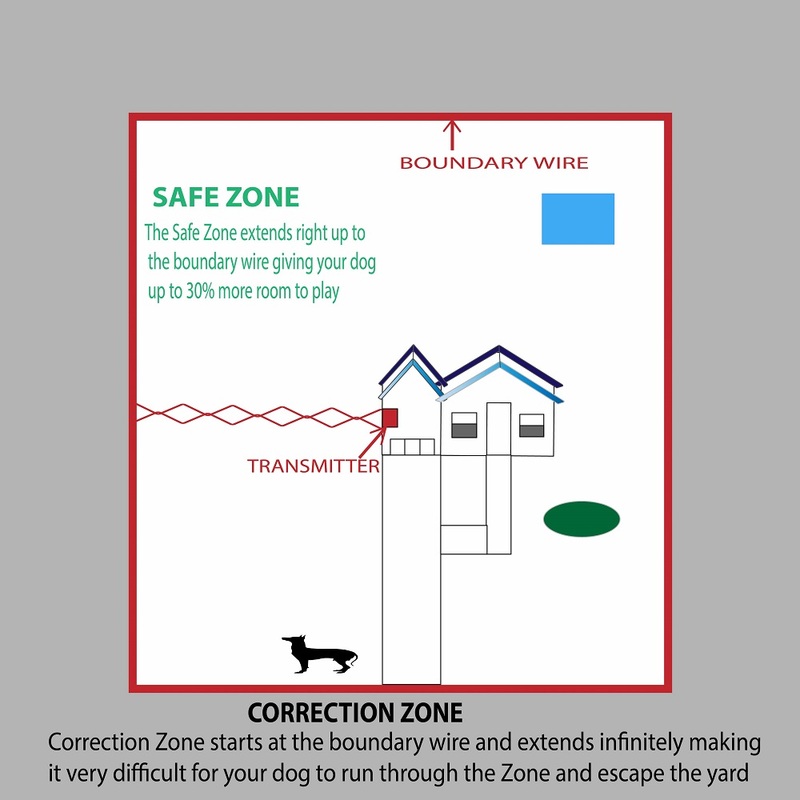 In YardMax mode the Correction Zone starts right at the boundary wire so your dog’s receiver collar isn’t activated until they actually cross the boundary wire. Remember when I said this section wasn’t going to cover specific details of how to install the YardMax? Well that wasn’t because those details aren’t important; it was because there’s so much to the installation process that I’ve written a separate article about it. Now that you know all about how to install this underground fence let’s move on to the functions and features of the YardMax collar. 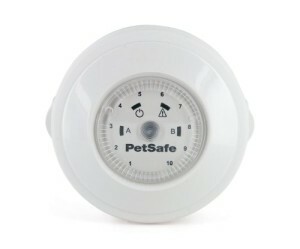 What Do You Need To Know About This PetSafe Underground Fence Collar? 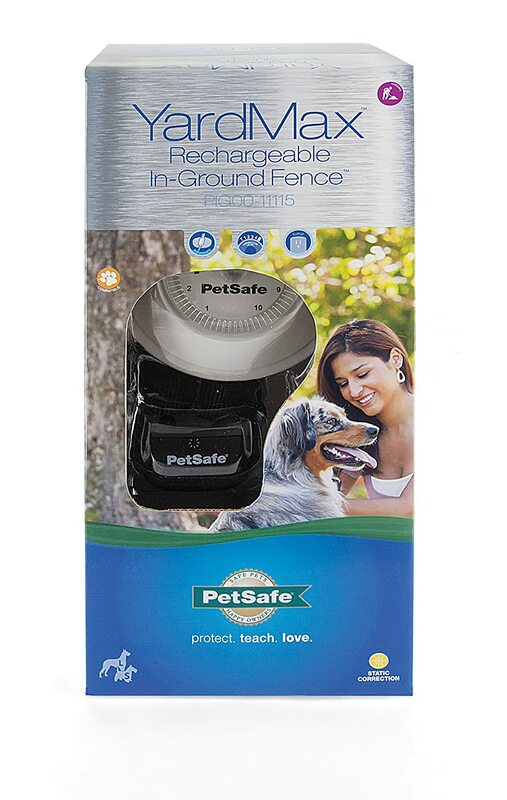 Small but mighty is a good way to describe the PIG00-11116 rechargeable receiver collar that comes standard with this underground dog fence. Weighing in at 3 oz the YardMax collar is one of the smaller lighter collars on the market but despite its size it’s loaded with features. Although the manufacturer puts the lower weight limit for the YardMax at 5 lbs many reviews of the PIG00 11115 recommend this fence for dogs 10 lbs and up. The charging adapter is capable of charging two collars at once and takes about 2-3 hours to do so. Once fully charged the collar’s good for anywhere up to 3 months and that’s a decent battery life compared to other systems where you have to recharge the battery every 6-8 weeks. There’s a low battery warning on the collar that will flash when it’s time to charge the collar and you can turn the collar off when it’s not in use to help prolong battery life. Made out of durable nylon with a convenient quick snap buckle, the YardMax collar strap fits neck sizes of 6″-28″. Although the manufacturer claims that it’s waterproof, I’d say it’s more water resistant because although it’s OK for your pet to swim with it on, submerging it for any length of time may cause damage. Despite its durable nature, the nylon material may wear out before the receiver unit does but if that happens you don’t need to buy a completely new collar. The receiver unit just slips off the old collar and can be placed on any non metallic collar of your choice, as long as it’s at least 3/4″ wide. The Mode button is a bit more difficult to access but that’s a good thing because it means there’s little chance that your dog’s static correction level will get changed inadvertently. When you first turn the collar on it goes into the ReadyTest mode — a self-test that takes about 8 seconds and ensures that the collar is working properly. After that it goes straight into the PerfectFit mode and this lets you know that the metal probes are making contact with your dog’s skin. This is important because if the probes aren’t touching your dog’s skin, they won’t feel the static correction. No other collar has the PerfectFit mode and it saves you from having to mess around with the collar to ensure it’s fitting properly. This is especially helpful if your dog has thick or long hair. As I’ve already mentioned, in addition to the beep only training mode this electronic dog collar has 5 progressive levels of static correction plus a beep only mode for training. Out of the box the collar is fitted with short (1/2″) contact points but longer ones (3/4″) are also included in the kit along with a little wrench to help change the probes should you need to. Providing they each have their own receiver collar the YardMax is capable of handling an unlimited number of dogs. And what’s really nice is that you can set the static correction level on each receiver collar independently and that means you can tailor the static correction level to the size and temperament of each of your dogs. Safety Time out: Automatically stops the electric stimulation after 15 seconds. 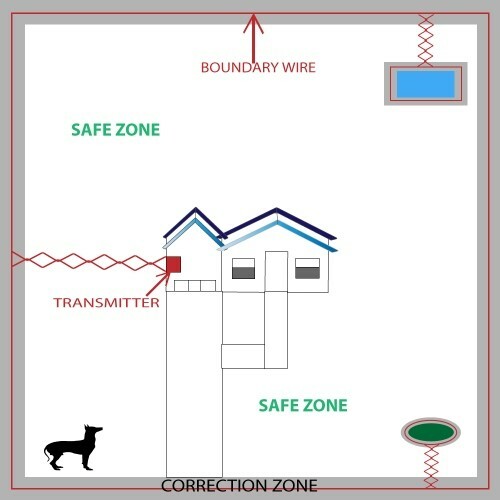 Run Through Prevention: Deters your dog from leaving the yard by ramping up the intensity level of the static correction as they get closer to the boundary wire. Anti Linger: Automatically gives your dog a static correction if they linger in the Warning Zone for longer than 2 seconds. 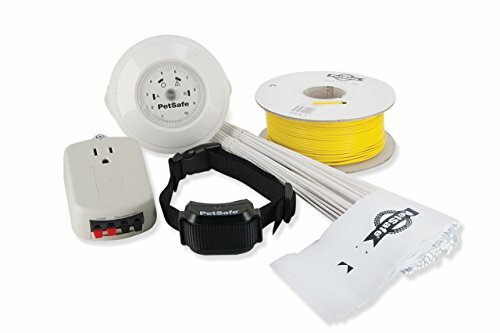 PetSafe Wire and flag kit – PIG00-13769:Your fence kit comes with enough supplies to cover about 1/3 of an acre. This wire and flag kit will expand your containment area up to about 1 acre and comes with 500 feet of dog fence wire, 50 flags, 2 wire nuts and 2 gel-filled capsules. Tip: Almost all electronic fence kits come with 20 gauge wire and it’s thin and fragile. To avoid the hassle of wire breaks down the road, many people upgrade to a heavier 16g or 14g wire at the time of purchase. If you order from Amazon you’ll have the option to upgrade your wire when you buy your fence. The chart below gives you an estimate of how much total wire you’ll need. Keep in mind that you may need more for any given area depending on what type of layout you want. Going to run your boundary wire along the ground. Going to attach it to an already existing above ground fence. Tip: If you want to save a bit of money you can probably get all the fencing supplies you need at your local hardware or home improvement store. 50 flags will be enough to cover about 3/4 of an acre. If your containment area is going to be larger than that you’ll need more flags during the training process. The RFA-2 flags come in bundles of 50. Because the receiver collar that comes with the YardMax can be used on such as wide variety of dogs the PetSafe YardMax Collar, PIG00-11116 is the only collar that’s compatible with the YardMax fence. You can have as many dogs as you want on the YardMax but each one will need their own collar. From time to time you’ll need to replace the metal contact points on the receiver unit. This handy pack contains everything you’ll need to do that, including 2 short contact points and 2 long contact points. The charging adapter for the receiver collar is capable of charging 2 collars at once but if you need to charge more than 2, the cheapest price I could find on the adaptor was at PetSafe. Check the price for the RFA-373 here. If you don’t take the time to train your furry friend to their new containment area you won’t have success with your YardMax fence. Training is so important that I’ve dedicated an entire article to it and you can read all about electric dog fence training here.